Part of the campus of the prestigious Phillips Exeter Academy is seen Monday, April 11, 2016, in Exeter, New Hampshire. Phillips Exeter Academy, which was founded in 1781, acknowledged in March 2016 that a teacher was forced into retirement in 2011 after admitting to two cases of sexual misconduct dating back to the 1970s and '80s. An outside investigation into sexual assault allegations at a prestigious New Hampshire prep school has identified four former staff members accused of abuse. 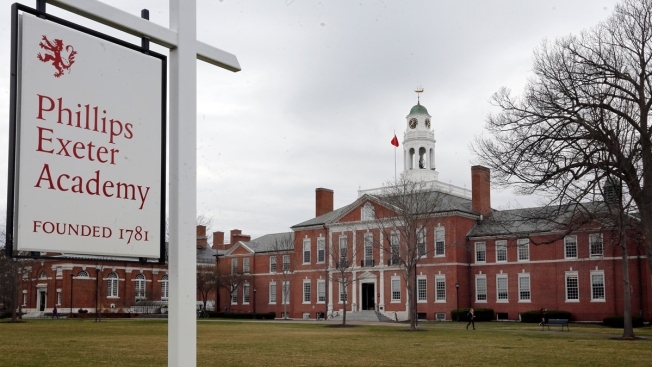 Phillips Exeter Academy said Thursday the abuses involving the four - three teachers and a psychologist - came to light following an investigation over the past several months by Holland & Knight. The allegations of sexually inappropriate behavior involved eight students over a period that spanned from 1966 to the 1980s. Two of those accused - the psychologists Eldeff Schwaab and teacher George Mangan - have died. The other two have been barred from the Exeter campus and, in the one case, stripped of his faculty emeritus status. The four bring to seven the number of former staffers accused of sexual misconduct at the school.